Frontline Spray is a long-lasting flea treatment. It kills about 98-100% of fleas on cats and kittens within 24 hours. One application kills and prevents fleas for up to 8 weeks in cats. Eliminating heavy flea infestation, Frontline Spray prevents flea allergy dermatitis. For paralysis tick control on cats use FRONTLINE SPRAY every 3 weeks. Consult your vet prior to using this product in breeding, pregnant and lactating queens. The spray on flea control formula is safe to use on kittens from 2 days of age. Frontline Spray has active ingredient fipronil. It readily penetrates into the cat skin. When fleas come in contact, the ingredient destroys fleas by paralysing their nervous system. It also eliminates biting lice on cats and protects them from diseases carried by lice. Controlling re-infestation, Frontline Spray protects felines from flea allergy dermatitis. Adjust the nozzle according to the spray setting. Apply Frontline Spray at 3 to 6 ml per kg bodyweight. Use the higher dose rate for long-haired or densely coated animals to ensure the coat is thoroughly wet. Spray the entire body and apply at the distance of approx. 10-20 cm. Apply against the lay of the hair, and ruffle the coat especially the long haired cats while spraying, so that the product is applied aptly. Let the product dry naturally. Do not use towel to dry your cat. An excellent flea control treatment for treating cats. Frontline Spray breaks the life cycle of flea by removing adult fleas. Highly effective for cats having heavy flea infestation. It prevents chewing lice on cats. Controls Flea Allergy Dermatitis when applied monthly to the affected pet. All other dogs and cats in the household should be routinely treated too. The spray form makes it easy to administer on animals. It is safe to use on kittens from 2 days of age. For use on cats only. Safe to use on kittens from 2 days of age. Do not take Frontline Spray near open flame or heat as it is highly inflammable. Keep away from direct contact of human eyes and skin. Do not eat, drink or smoke while applying the spray. Consult a vet before using this flea control spray on aged and debilitated cats. 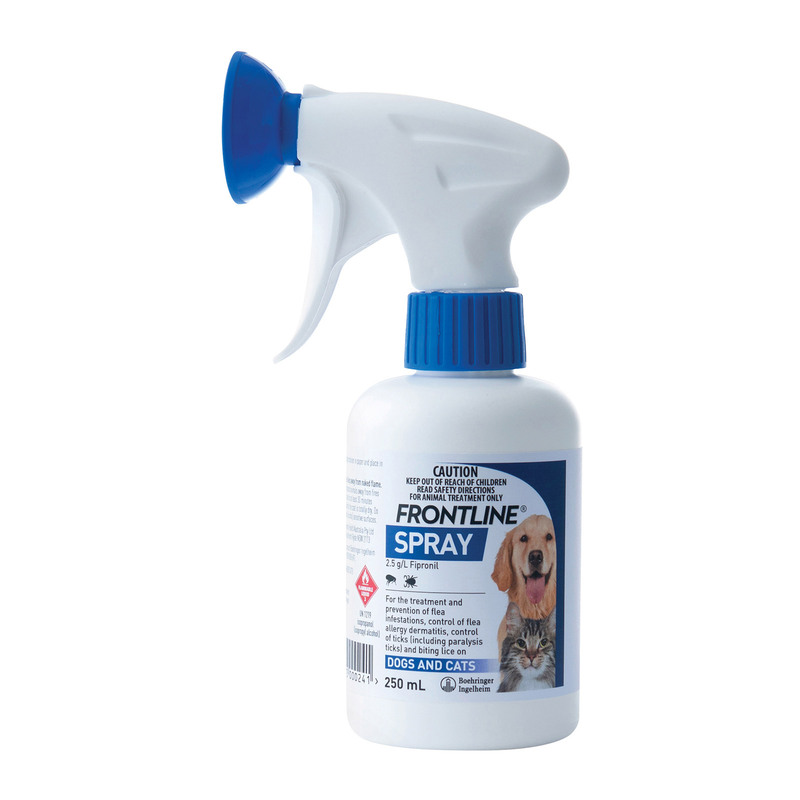 Frontline Spray is not intended for pets hypersensitive to the ingredient of Frontline. I always keep one in stock and use it regularly. It has definitely kept my cat flea free. If you don't like messy solutions, then using frontline spray is just easy and mess free. I always use this on my kittens and they too are happy about this. My and my kitty's favorite. It takes me just few minutes to spray this on her fur and I don't have to hold her tight or fight with her to apply all other ones. Thanks vetsupply for faster delivery. Thank you VetSupply for a great value for this product, it is a trustworthy product to use on my cats, and also appreciate the free shipping on the products!